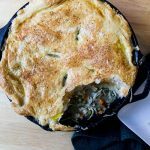 The classic homemade chicken pot pie is the ultimate comfort food! It's a family favorite. In a 10-inch cast-iron skillet, melt butter or oil over medium-high heat. Add beans, onion, carrot, and celery; cook until softened for about 5 minutes. Add garlic and cook for about 1 minute. Sprinkle flour over vegetables and cook for 1 minute, stirring constantly. Gradually stir in 2 cups reserved broth and cream. stirring constantly until mixture begins to thicken. Remove from heat. Stir in chicken, parsley, thyme, sage, salt, and pepper. For the crust roll puff pastry into a 10-inch square on a lightly floured surface. Place over hot chicken mixture, letting excess extend over sides of skillet. If there is too much hanging over the edge, just tuck it under. Press the pastry lightly to the skillet edge. Whisk together egg and 1 teaspoon water in a small bowl. Brush pastry with egg mixture. Cut 4 vents on the top of the dough to release steam. Sprinkle with salt and pepper. Brush underside of pastry corners with egg mixture. Bake until filling is bubbly and crust is puffed and golden brown, about 25 minutes. Let cool for 15 minutes before serving.